For most folks who attended, Baselworld 2013 will be remembered for the amazing brand new hall and the opening concert by Lana Del Rey. But for me it was the show where I ordered four watches, the most I have ever done. There were two from mass manufacturers, one from an independent and one from a firm somewhere in the middle. I was wearing both the pieces from the major firms within six months of the show closing & am still waiting for the independent to tell me he has begun work on my watch, which leaves the one somewhere in the middle. That is the one I want to talk about now. Just over two weeks ago, I boarded the Eurostar train at London’s St. Pancras station and a little over two hours later found myself in Paris, I jumped into a taxi and made my way to the Place Vendôme. Some people say that Geneva’s Rue du Rhône has the highest concentration of watch stores in the world. I have responded by declaring that the shopping mall beneath Singapore’s Marina Bay Sands complex makes the Rue du Rhône look like a developing country. However, both opinions are ultimately wrong since the world’s watch-shopping HQ is the Place Vendôme. The list of brands covering three sides of the square (The Ritz Hotel occupies an entire side) read like a ‘Who’s Who’ of the watch business; Patek, Dior, Hublot, Chaumet, Piaget, Blancpain, Van Cleef & Arpels, Boucheron, Jaeger-LeCoultre, Rolex, Louis Vuitton and Cartier, with just two interlopers, J.P. Morgan and Swatch. The keen eyed observer will have noticed a preponderance of French or French owned brands, and it was to one of those French brands that I was heading. Louis Vuitton have boutiques all over Paris and the one on the Place Vendôme is probably their smallest and, perhaps, their most exclusive because there are no handbags or shoes in this boutique. Rather, its Place Vendôme boutique is exclusively high-end watches and jewellery, and it was at Place Vendôme where I met with Hamdi Chatti, President of Louis Vuitton Watches & Jewellery. A little background on Hamdi is useful here. 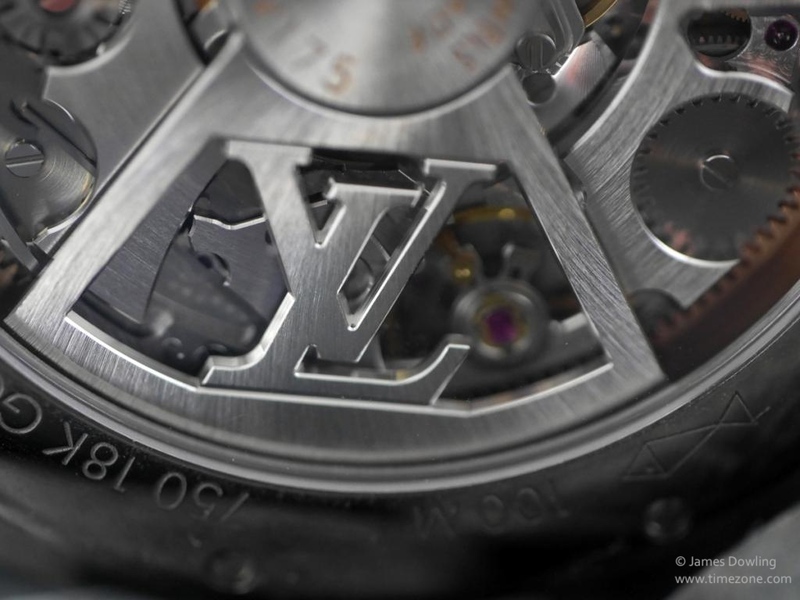 Prior to Louis Vuitton, he ran the watches operation at Montblanc, where he supervised the renaissance of the Minerva brand and its high end Villeret operation. 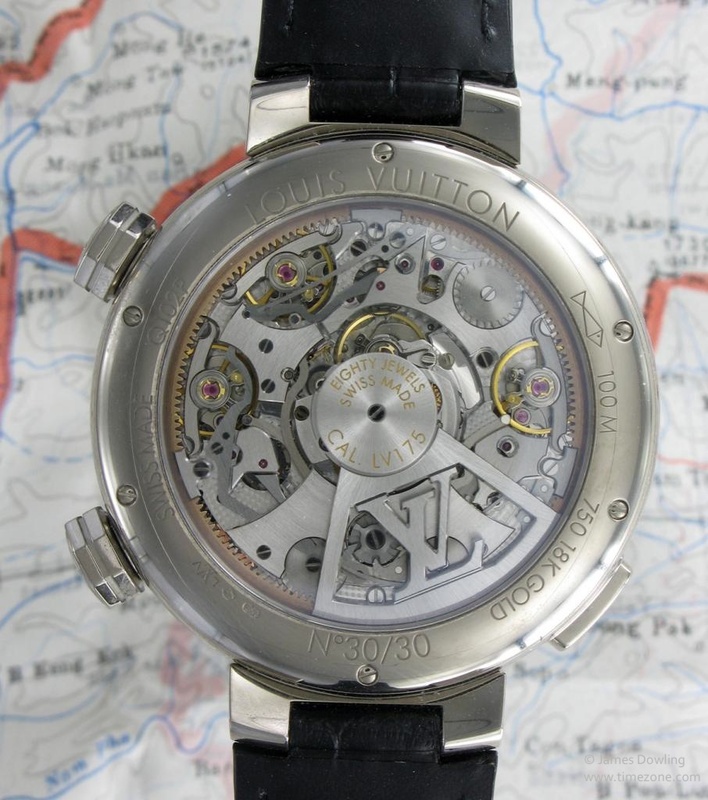 Before Montblanc, he ran Harry Winston where he supervised the Opus co-operation with independent watchmakers. 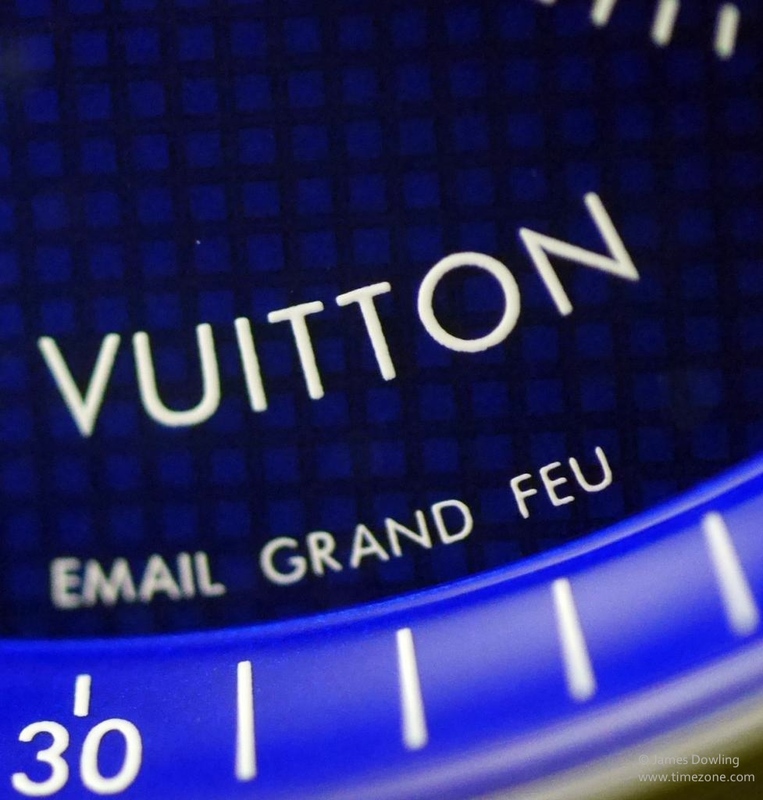 Since his background is working with firms who have little or no profile in the watch business and turning them into high end powerhouses, it is easy to understand why Louis Vuitton wanted him. 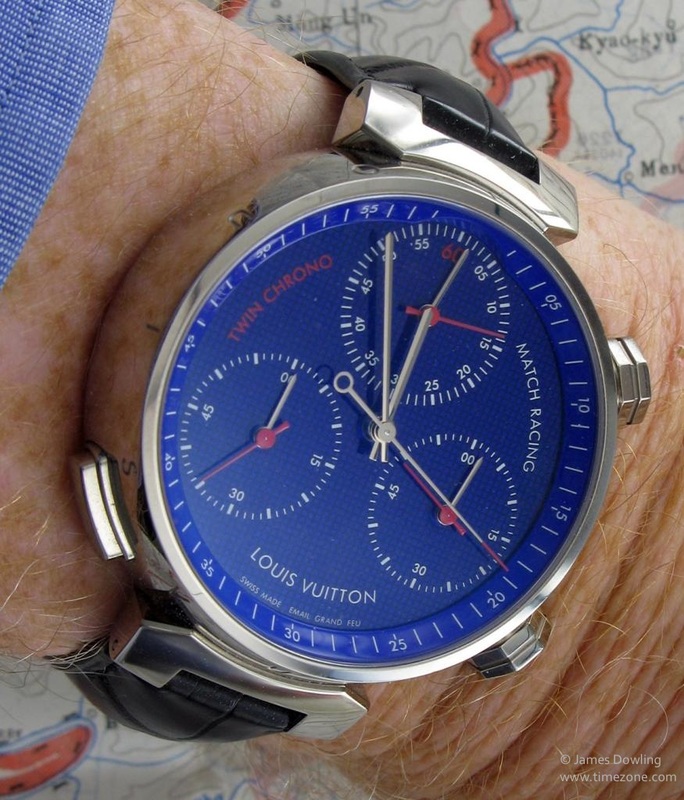 All this leads us to the Louis Vuitton Tambour Match Racing Twin Chrono (the “Twin Chrono”). What I loved about it from the moment I saw it was firstly the dial, a sensational blue enamelled guilloché one with red and white print. And even more attractive was the new complication it presented, which was nothing less than a complete reimagining of the split seconds chronograph. A conventional split seconds chronograph has three buttons which must be pushed in a strict order in order to time two consecutive competitors and when the second one has finished you need to perform an arithmetical calculation to determine the time difference. The Twin Chrono reduces this to one button and zero calculation. The lower dials start instantaneously and simultaneously when the button is pressed, when the first competitor crosses the line the button is pushed again and the lower left register stops whilst the lower right one continues to time the other competitor and the top dial also starts. As the second place competitor crosses the line the button is pushed again and both the running registers stop, with the lower right one reading their time and the top one showing the difference between the two. One other difference between the Twin Chrono and normal chronographs is that the sweep central seconds hand is not part of the chronograph mechanism, just a normal sweep seconds. 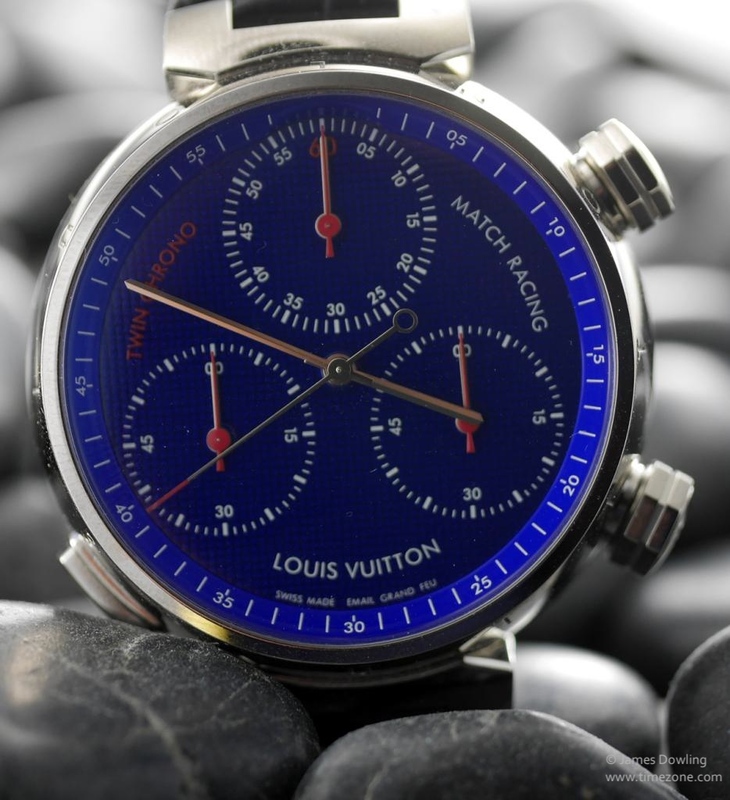 The watch was introduced to celebrate the 30th anniversary of the Louis Vuitton Cup, the trophy awarded to the victor in the run-offs to decide who will be the challenger to the holder of the America’s Cup in yacht racing. Which goes some way to explaining why it is designed to time two competitors (the run offs are always just two boats) and why only thirty examples were made. Whilst the watch is much simpler for the user to operate, this is counterbalanced by the complexity of the movement; essentially there are four separate movements inside the case; the main timekeeping one and three individual ones for each of the three registers. All these need balance wheels, escapements and shock protection; it might well be the ‘densest’ movement I have ever seen, there seems not to be a cubic centimetre of space within the case. You can see the three balances for the registers around the outside of the movement and the timekeeping balance near the centre. 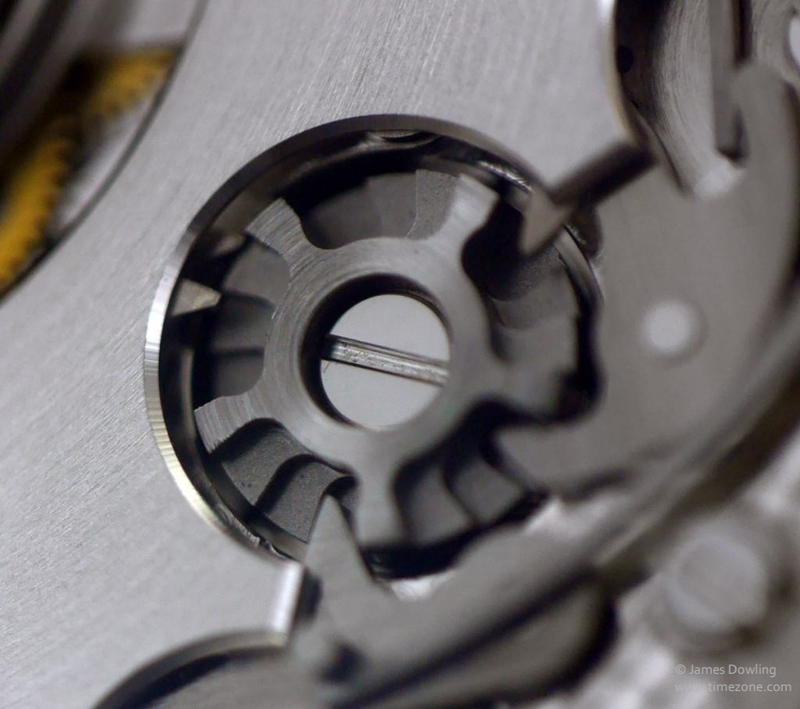 You can also see the exquisite level of finishing on the movement. A conscious decision was made not to use traditional perlage and Côtes de Genève style finishing on the movement, but instead to use an equally delicate but more modern radially brushed finish. The anglage, the polished screw heads and other trademarks of quality workmanship are still visible in the image below. 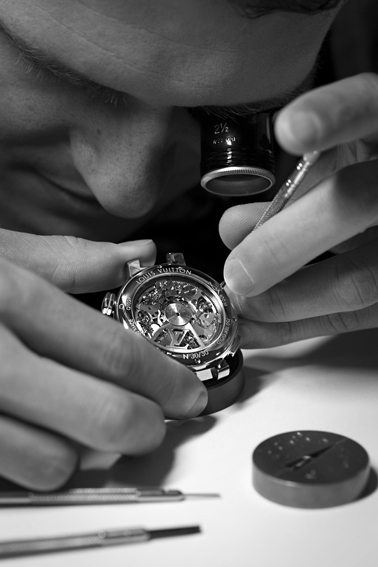 The most intricate component in the entire watch is the column wheel which is the ‘brain’ of the watch. Here it has three levels, or steps, and it is these three levels which control the chronograph functions. It is, in itself, a work of art. Hamdi told me that setting up this wheel and doing the final ultra precise machining to make sure that all the registers start, stop and reset in their correct order is as complex as fine tuning their minute repeater and goes a long way to explaining why it has taken almost 18 months to produce the thirty watches in the series. There are lots of lovely little touches in the case too; the upper crown winds and sets the three hands, whilst the lower one winds the barrel for the three registers, they are not identical, whilst the upper one displays a recessed “LV” motif. 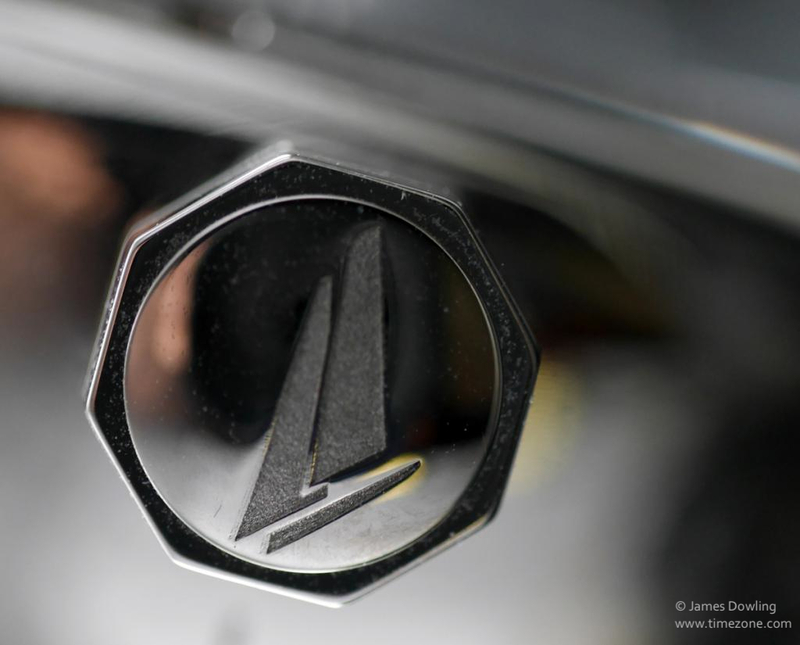 The lower one bears the logo of the Louis Vuitton Cup. 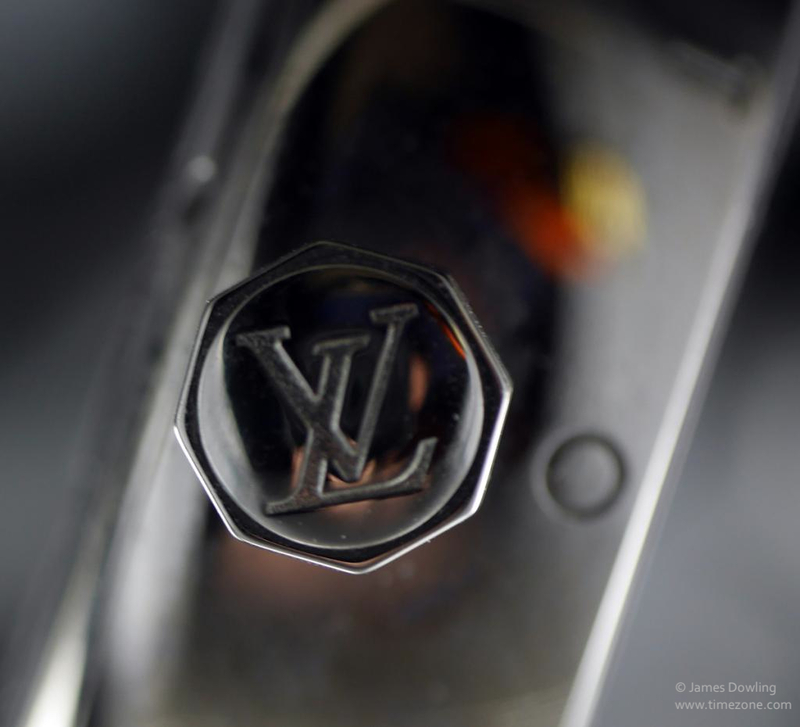 So, the question you are probably asking is, “How did LV go from making very expensive luggage to making cutting edge watches?” The answer is simple, they bought in the expertise. Over the last few years they have purchased the boutique watchmaker, La Fabrique du Temps and the two dialmakers ArteCad and Léman Cadrans. La Fabrique du Temps was one of those small operations, with less than 50 employees, who work silently behind the scenes for other manufacturers. For example, La Fabrique du Temps build the sensational Laurent Ferrier Galet Double Spiral Tourbillion which won the 2010 GPHG on its introduction; all of Ralph Lauren’s tourbillions; watches for Manufacture Royale; plus, several other firms who like to pretend that they do it all in-house. 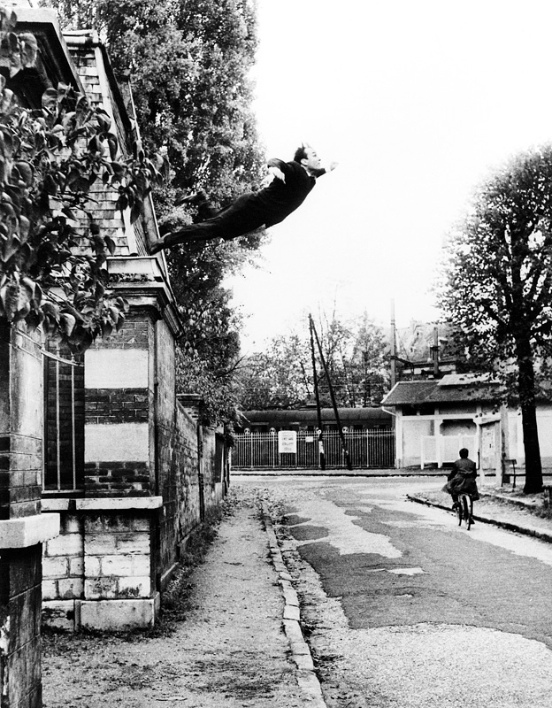 Thus far, I haven’t mentioned the thing which drew me to the Twin Chrono in the first place – the dial. Simply put, the enamel dial is sensational. Using a white gold base, which is then engraved in a grid pattern of 1mm squares, a coat of blue enamel is then hand applied, fired and then repeated several times until the blue is deep enough that you feel you could dive into it. Then the registers and the text are applied before a final firing. I have always loved enamel dials, ever since my first Rolex Oyster cushion. Indeed, after 30 years, the Patek 2526 remains my favourite Patek Philippe. Yet, I have never owned a coloured enamel dialled watch. Something instantaneously drew me to Twin Chrono dial and, it was only after I had owned it for a week, that I realised that the dial seems to continuously change shade and tone under different light. Indeed, although the dial and the rehaut are the same colour, because they are at different angles, they often seem to be different colours due to the way the light hits them. 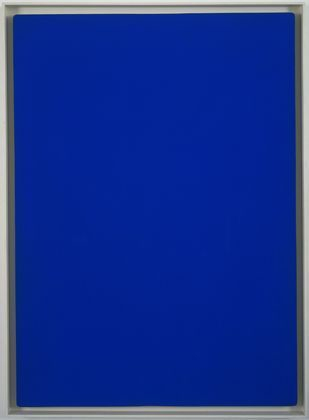 Before you start to laugh at the conceit of a painting in just one colour, consider that Klein’s paintings have sold for as much as $36 million, which makes the €50,000 (plus tax) I paid for the Twin Chrono seem extremely reasonable. The Twin Chrono has been almost constantly on my wrist since I got it and every time I glance down at it, it makes me smile; which is my test of a ‘keeper’ watch.